Researchers: Naoki Uchida, Takeshi Iinuma, and Ryota Hino, Tohoku University; and Robert Nadeau and Roland Burgmann, University of California, Berkeley. Using years of data from the dense geodetic and seismic networks in Japan, researchers find that slow slip events that repeat on intervals of 1 to 6 years either coincide or precede large magnitude earthquakes along the major subduction zone off the coast of northeastern Japan. In particular, a slow slip sequence preceded the magnitude 9 Tohoku earthquake and probably affected the stress field of the fault. Recognizing and understanding these repeating silent slip sequences will improve earthquake forecasts and probabilities. Slow slip or aseismic fault creep refers to slow and small motions along faults that sometimes tend to repeat on regular periods. They are referred to as silent earthquakes because they do not produce a detectable large earthquake record on seismometers. 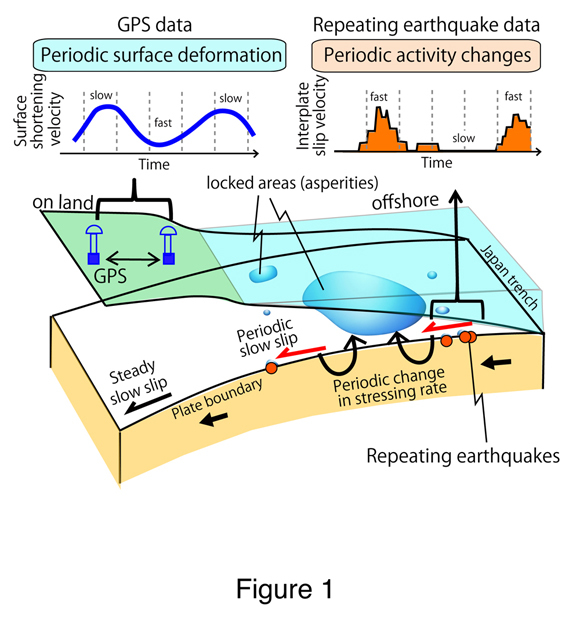 Geodetic data and detailed analysis of seismic records from thousands of small repeating earthquakes allows researchers to define these events and how they affect the stress field of a fault. These slow moving events are thought to release some stress on specific areas of a fault zone and can change the stress field in the creeping area surrounding the active fault. In some cases, the slow slip will increase the stress in adjacent areas and bring the fault closer to rupture. Importantly, it would be helpful to know how slow slip might affect the stress field where large earthquakes are possible. Given that there are fewer large events and slow slip is harder to detect, there are limited observations of such relationships. 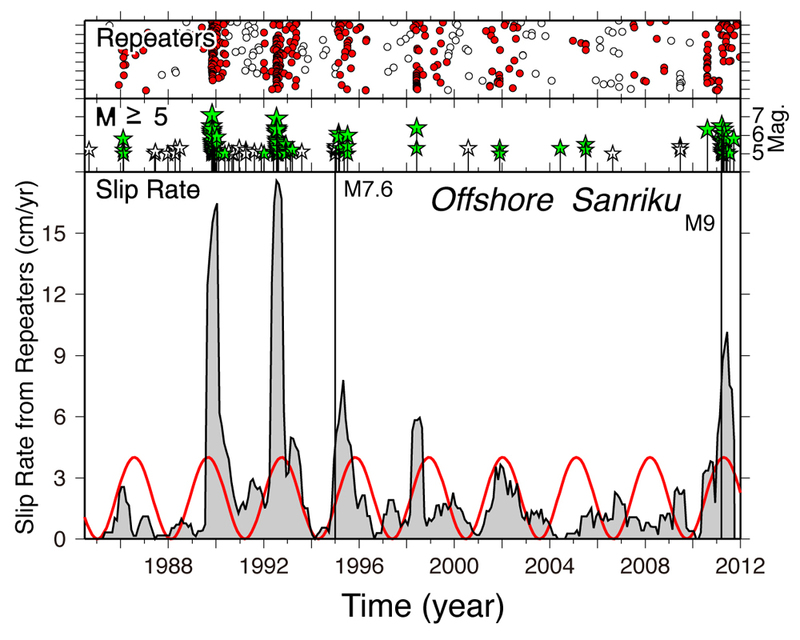 Here the authors examined about 28 years of seismic data and 16 years of geodetic data to look for any correlation between large magnitude earthquakes and slow slip on the major subduction zone offshore of northeastern Japan. 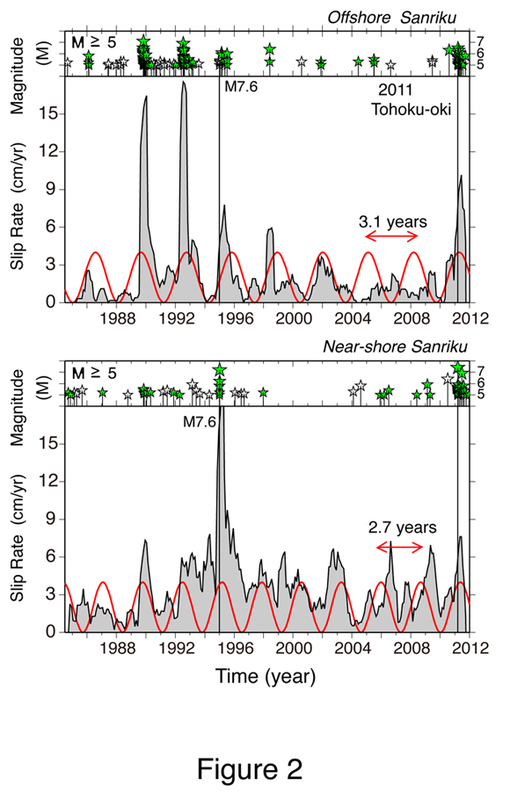 Analysis of the slip rate variations from small repeating earthquakes and GPS in the Sanriku area shows a repeat time of 3 years for offshore areas and 2.7 years for near-shore area. Comparing these data to the occurrence of magnitude > 5 earthquakes in the region, shows that large earthquakes tend to cluster within the slow slip event periods, especially near the peak of the slow slip events. The authors found similar correlations for 8 other areas in the near and offshore regions along eastern Japan. A key point is that the slow slip precedes the large earthquakes rather than the earthquakes triggering slow slip. This information will be valuable for considering earthquake forecasts and probabilities. 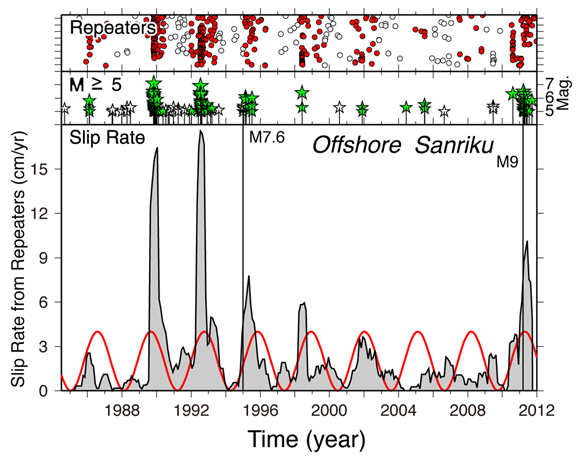 N. Uchida et al., (2016), Periodic slow slip triggers megathrust zone earthquakes in northeastern Japan, Science 351, 488, doi:10.1126/science.aab0460.